Annabel Claprood, 17, survived the Parkland school shooting last year. After, she began working with horses. Here, she is at a barn in Parkland. Annabel said horses have helped her manage the stress she feels about going to Marjory Stoneman Douglas High. When Annabel Claprood walks into a room, the first thing she does is look for a place to hide. The 17-year-old has practiced moving quickly from the driver’s seat of her car to the back, so she can’t be easily seen through the windows. Her mother, Elyse Claprood, uses her cell phone to closely track her daughter’s location, feeling relief only when she confirms, yes, Annabel is at home. She’s at school. At the horse barn where she volunteers. Annabel Claprood, 17, and her mom, Elyse, are next to each other on the couch in their living room in Coral Springs. River, the therapy dog who works in the library at Marjory Stoneman Douglas High School, sits at their feet. A year ago, the sound of gunfire interrupted Annabel’s sophomore Spanish class at Marjory Stoneman Douglas High School in Parkland. The trauma of last Feb. 14 interrupted her childhood. Now, her life is full of fear and creeping panic. Flashbacks. Stress. Therapy appointments. Since Annabel survived the nation’s deadliest high school shooting, she and her mom have sought counseling, embraced activism and worked with animals in their search for comfort and relief. Throughout that time, they’ve wrestled with whether Annabel should remain at Stoneman Douglas, which is not only the site of her trauma but also of a uniquely understanding and supportive community. They've spent the last year of their lives trying to reclaim their fundamental feeling of safety and peace — and considering how to go on without it. Listen here to a short documentary about how Annabel Claprood and her mom, Elyse, have coped with the trauma of the Marjory Stoneman Douglas High School shooting over the last year. One week after 17 people were killed at her high school, Annabel Claprood told the whole country she wouldn’t go back until it was safe. “Will my school campus be safe when I return?” Annabel posed her question to Congressman Ted Deutch. “Because I plan to not return until I know something is going to change,” she said. “And I’m not the only one.” She solicited loud applause from the crowd of parents, students and community members gathered at the BB&T Center in Sunrise. Days later, Annabel and her mom, Elyse, boarded a bus in Coral Springs with plans to bring that same message to the state Capitol. They arrived in Tallahassee on Feb. 26 with a group of about 50 others for a whirlwind lobbying trip. 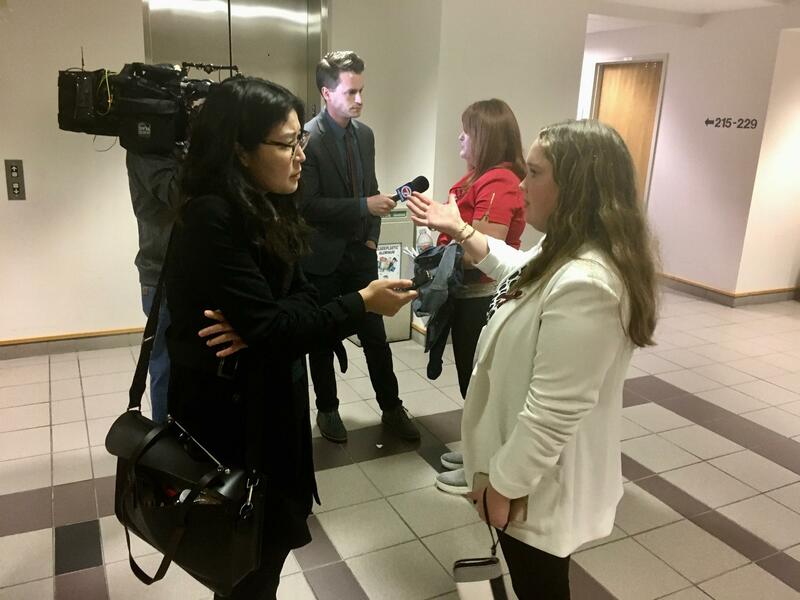 Reporters interview Elyse Claprood and her daughter Annabel outside a legislative committee meeting in the Capitol complex in Tallahassee last February. In the short time since the shooting, lawmakers had already crafted a bill in response: It contained new school safety requirements, additional funding for students’ mental health needs and new restrictions on gun purchases. It also included a plan to arm teachers. Annabel, Elyse and other people from Parkland and Coral Springs lined up at a House appropriations committee meeting to testify on the bill. Annabel had a prepared speech; she spent the morning writing and revising it on the notes app in her phone. But when she first stepped up to the podium during a House appropriations committee meeting, she spoke freely, without a script. “The one thing that I definitely don’t want to be returning to school, is having my teacher have a gun,” she said. Later, Annabel shared the details of her experience on Feb. 14. She became emotional: “Twelve days ago, 18 hours and 56 minutes ago, I was on the floor scared for my life because someone walked into my school with an automatic weapon. I was in the first classroom that the shooter approached. I saw everything. After a day of meeting with legislators, seeing the political jockeying that was going on over the bill, Elyse was stressed and upset. She argued they were being “sneaky” and “playing games” while children's lives were in danger. The trip didn’t ease her worries. When the Claproods left Tallahassee, they weren’t satisfied with the answers they’d gotten to the question Annabel voiced at the town hall: Would school be safe when she returned? Elyse Claprood stands behind her daughter Annabel, who is sitting in a chair in state Sen. Gary Farmer's office in Tallahassee. 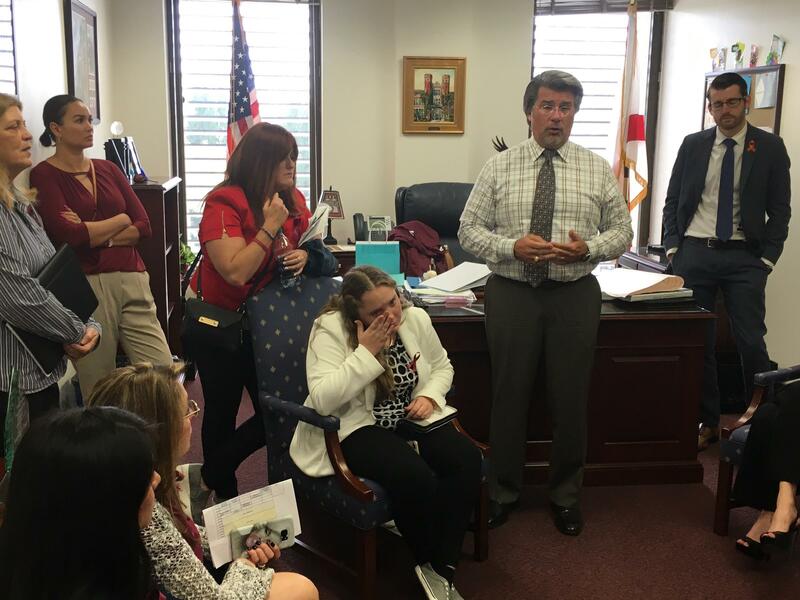 The Claproods went on a lobbying trip with other Parkland and Coral Springs parents and students shortly after the shooting in February 2018. Soon after their trip, the Florida Legislature approved the Marjory Stoneman Douglas High School Public Safety Act, and then-Gov. Rick Scott signed it, with families of Parkland shooting victims offering their unanimous support. The final bill didn’t let teachers carry guns, after all. A compromise allowed for arming school staff members whose jobs weren’t primarily in the classroom, if they volunteer and receive training. The law also required a police officer or armed guard on every school campus. On Feb. 28, the first day back at Stoneman Douglas after the shooting, local law enforcement agencies offered a heavy police presence, to help students feel more comfortable. And Broward County schools superintendent Robert Runcie said he was nearly tripling the number of security guards at the school permanently. But Annabel Claprood and her classmates had good reason to doubt them. The sheriff’s deputy who had been assigned to protect the school hid during the shooting rather than entering the building and attempting to stop the massacre. A security guard was the first person to see the shooter on campus, recognized that he was carrying a rifle bag, and failed to confront him or lock down the school. 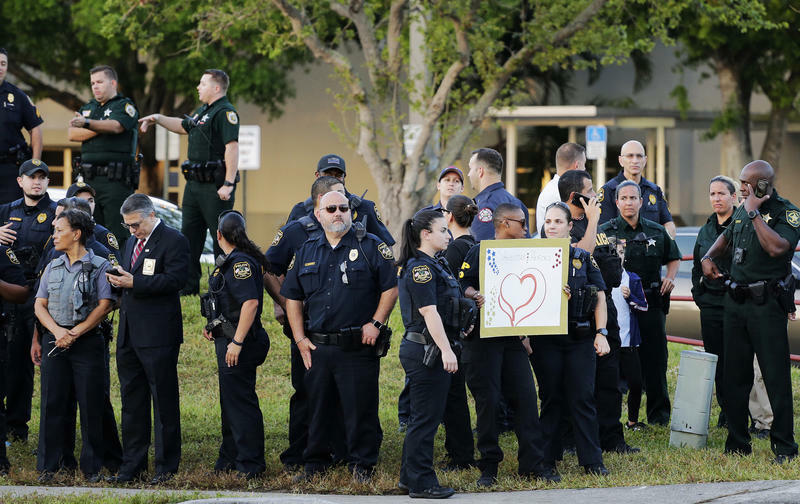 Police line the campus of Marjory Stoneman Douglas High School on the first day back after the shooting, Feb. 28, 2018. Sophomore Annabel Claprood didn't feel safe at school, even with police and security guards there. Within six weeks of classes resuming, a different sheriff’s deputy was found sleeping in his car on campus. The confessed shooter’s brother trespassed at the school. Two students were arrested for bringing knives inside. There were threats of another attack on social media. Annabel was cautiously appreciative of the new policies put in place requiring students to carry clear backpacks and wear their IDs at all times. But she was frustrated with what she described as inconsistent enforcement of the rules. Some students protested the clear-backpack policy by coloring in the plastic with black markers or covering it with paper so their bags’ contents were obscured. Annabel and other students related stories of students bringing in other bags, in addition to the clear ones, that weren’t always getting searched. Some kids were skirting the ID rule by showing an old card or wearing a friend’s, Annabel said. Sometimes Annabel would break the rules on purpose to see if someone would stop her, to test if the new systems the adults put in place were working. When no one did, she was outraged. She felt that the police and security presence at Stoneman Douglas was lacking. Elyse Claprood, Annabel’s mom, called me, fuming. Annabel turned the camera and showed the main courtyard on campus at Stoneman Douglas — empty. “Just thought I’d share,” she concluded dryly. The high school’s schedule alternates between silver and burgundy days, with the school colors signaling to students which series of classes they would attend. Feb. 14 was a silver day. After the shooting, the building where the bloodshed took place was shuttered. The 1200 building — or the freshman building, as students call it — will eventually be demolished. In the short term, all of the classes that were in that building were redistributed throughout the large campus, with teachers doubling up and squeezing extra students into classrooms where they could. But on silver days, Annabel still had to walk by the building to get to her classes. So, a lot of the time, she just wouldn’t go. “Going to school was really hard for her, because nobody could ensure her safety,” Elyse said. It’s usually when she was walking from one class to another that Annabel would start to feel panicky, disoriented. In those moments, she remembered what a therapist in Stoneman Douglas’ wellness center told her about how to ground herself. She could rely on her senses, make a list in her head of all the things she could see, hear, touch, and so on, to remind her where she was and that she was safe. “That has been one of the only coping mechanisms that has helped me calm myself down,” Annabel said. “I start to get anxious as I'm walking to class, and that's when it comes to use: ‘OK, I see people walking. I hear people talking. I hear my music,’” she said. But she feels conflicted about using her earbuds. But, at the same time, she’s nagged by worry: If her music is too loud, will she miss the sound of an approaching danger? She was wearing headphones before Spanish class on Feb. 14. “As I was walking to my classroom from the stairwell, I didn't hear him loading his gun, because I had my headphones in,” she said. Now, “I'm more cautious about it,” she said. She keeps the volume low, so she can hear what’s around her. Annabel remembers what song she was listening to that day: “Waves” by Dean Lewis. She still plays it sometimes. But not when she’s alone. 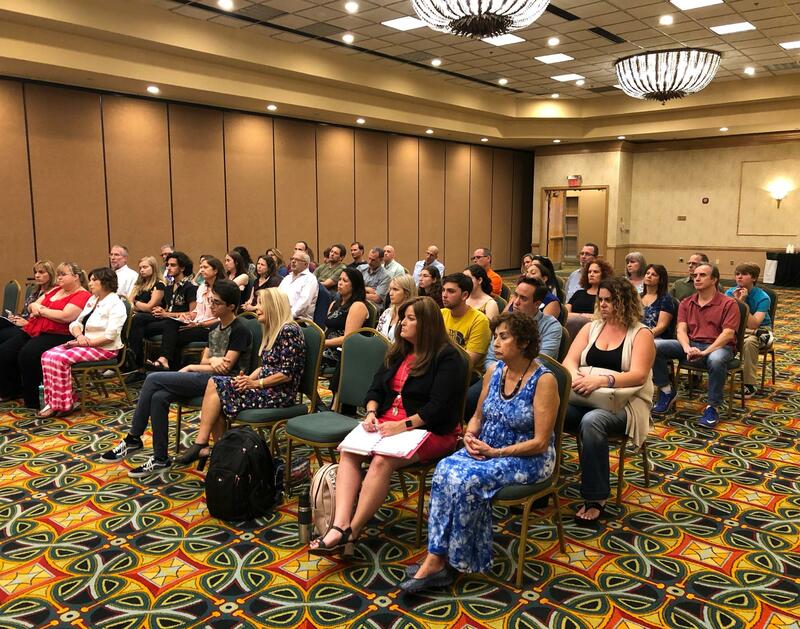 Elyse Claprood and her mother, Doris Goldberg, (front row, far right) attended a meeting of Parkland families with former U.S. education secretary Arne Duncan at a hotel over the summer. Claprood, whose 17-year-old daughter survived the Marjory Stoneman Douglas High School shooting, said her life as a mom is now full of school safety meetings and community activism. For Elyse Claprood, being Annabel’s mother now meant getting involved in politics. Working toward laws that promote safer schools and gun reforms like universal background checks felt like an urgent requirement. “My world as a mom has become filled with safety meetings, community activism,” she said. “I never considered myself an activist.” But now, she had to, “because of the situation that we’re faced with,” she said. She and Annabel traveled to Washington, D.C., in June for an ACLU event bringing together student activists from around the country. In July, Elyse was invited to join a small group of Stoneman Douglas parents to meet with former U.S. education secretary Arne Duncan. She sat in the front row of chairs in a small ballroom at a hotel in Coral Springs, as Duncan floated the idea of a short-term boycott of public schools to pressure Congress for gun-control legislation. She was supportive of these national efforts, but privately, she was more concerned about what was happening in her household. She was discouraged about Annabel’s struggle to keep going to school after the shooting and worried how her education would suffer if that continued. She was concerned about her daughter’s anxiety, and her unpredictable reactions to triggers, like loud noises. While Elyse had been unimpressed by what she saw in Tallahassee during their lobbying trip, Annabel had been inspired. She saw a future for herself there. She thought she might attend college in the capital or maybe even run for office herself one day. She jumped at an opportunity to do a summer internship at her Congresswoman’s office. She worked on Friday afternoons in Debbie Wasserman Schultz’s office in Sunrise, mostly answering calls from constituents. 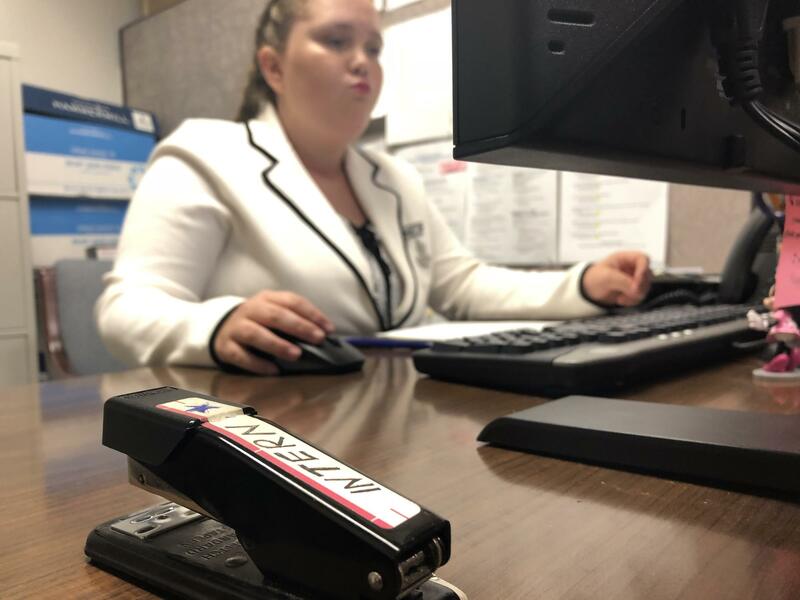 Annabel Claprood works during her internship at Congresswoman Debbie Wasserman Schultz's office in Sunrise during the summer between her sophomore and junior years at Marjory Stoneman Douglas High School. She found herself drawn to politics after advocating for school safety legislation in Tallahassee. (Above) Annabel Claprood, 17, leads an Arabian horse to a stall at a barn in Parkland. (Below) Annabel gives a kiss to a horse she bonded with. 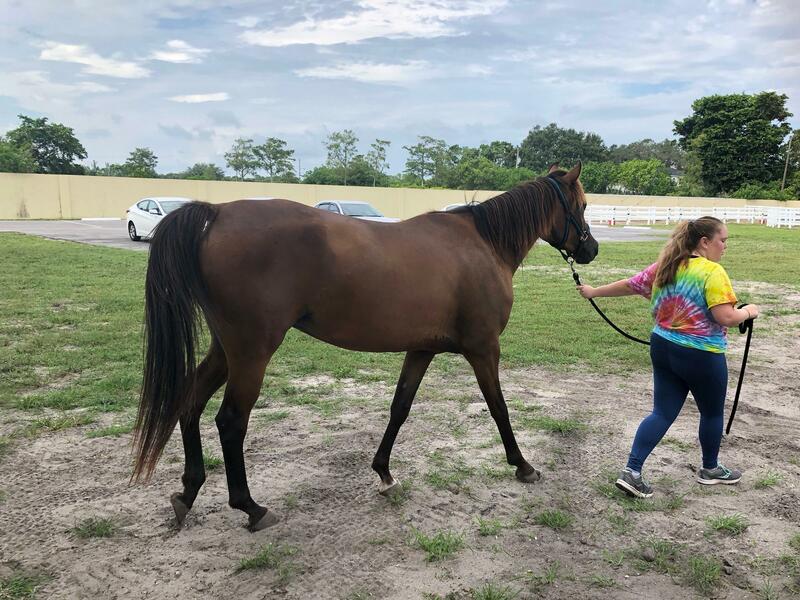 Working with horses has helped her feel calm since surviving the shooting at Marjory Stoneman Douglas High School. Annabel’s other new interest since the shooting: horses. Her friend works at a horse barn and started taking Annabel there after school. It made her feel peaceful and happy. So she volunteered at a different barn in Parkland over the summer. I met her there one day in July, and it was scorching. About a dozen horses were standing around in a grassy field, and they started walking toward us as we approached from the other side of a white fence. The horses were Arabian, raised to compete in beauty competitions. Some were brown. Others, grey with black around their snouts. They had lean bodies and big nostrils. A few of them were wearing mesh masks to keep the relentless flies out of their eyes. Annabel started the process of bringing the horses into their stalls, to get them out of the sun. She struggled to fasten the halters around their necks. Annabel planned to keep going to the barn after school, when it started up again in the fall. 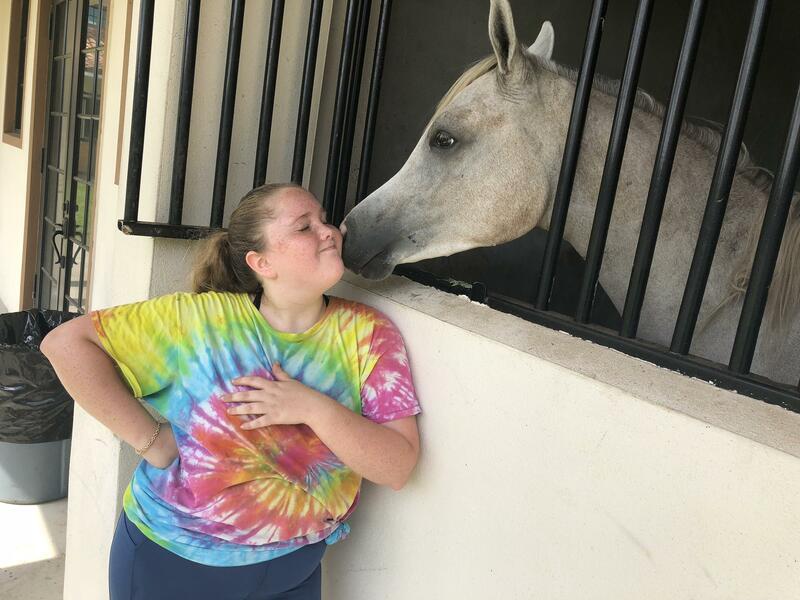 She believed spending time with horses would help her keep going back to Stoneman Douglas. “I definitely think that it will relieve some stress from going there,” she said. When school started again last August, for Annabel Claprood’s junior year, Marjory Stoneman Douglas High School had a big problem: The fire alarm kept going off, and it was reminding survivors of Feb. 14. The shooter’s gunfire set off the alarms in that building, sending students into the hallway, toward danger, when they should have been sheltered inside classrooms. “When I hear the fire alarms, I feel like I'm in the 1200 building again, and it's happening all over again,” Annabel said. The alarm has gone off unexpectedly at least seven times this school year. Three of those times, it was a student who pulled it. Once, “I completely hyperventilated and had a complete panic attack of the middle of class,” Annabel said. She called her mom. Her teacher contacted the wellness center, where there are therapists available for students in need. Help arrived immediately. “They took me down to the wellness center, and I walked into a room full of kids that had the exact same thing,” she said. 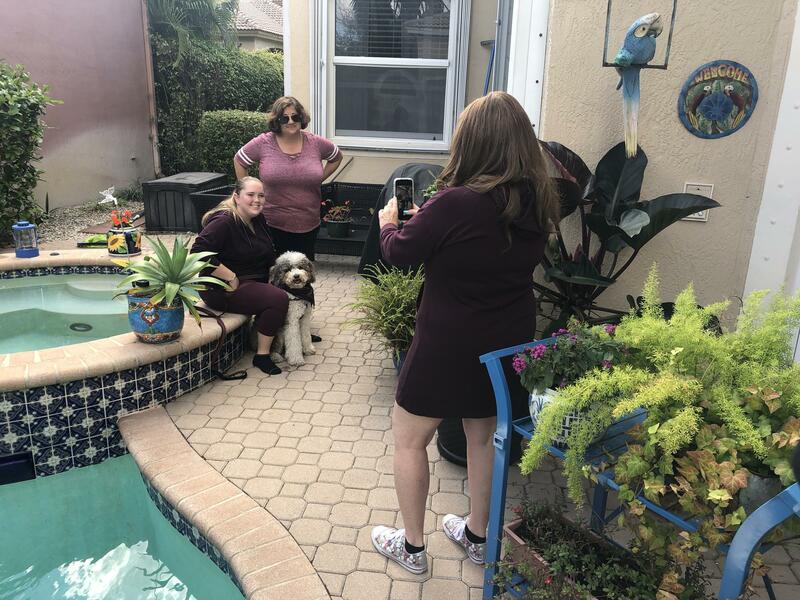 Elyse Claprood takes a photo of her daughter Annabel with Diana Haneski, the librarian at Marjory Stoneman Douglas High School, and River, the therapy dog Haneski brings to the school every day. 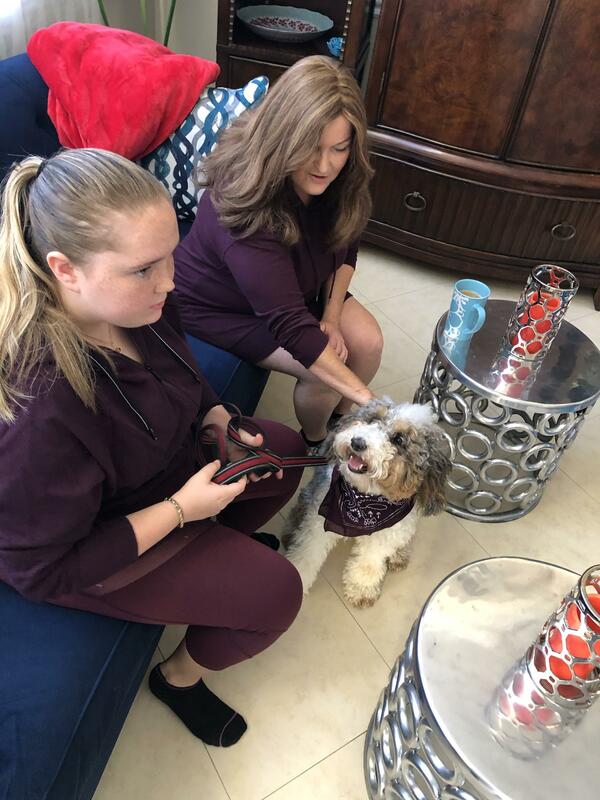 Annabel has bonded with River, and she invited Haneski to bring the dog to the Claproods' home in Coral Springs for an interview with WLRN. This is one of the reasons Annabel went back to Stoneman Douglas. She couldn’t imagine teachers or kids anywhere else understanding what she was going through. She was committed to staying. Her mom, Elyse, wasn’t so sure. Elyse said she worried every day when Annabel went to school that she wouldn’t come home. Her coping mechanism: “I have a tracking device on her,” Elyse said half-jokingly, referring to the location function in her daughter’s phone. She laughed, and Annie playfully scolded her — “oh, mother” — with a shrug and a roll of her eyes. The last two months of the year came with some troubling findings from the Marjory Stoneman Douglas High School Public Safety Commission. The group, which was empaneled by lawmakers to investigate what went wrong and recommend policy changes, was ready to submit its initial report to the governor and the Legislature. Members voted to include a controversial recommendation: letting teachers carry guns. “It would be people who are well-qualified, well-trained, who volunteer, who meet rigorous selection and rigorous training standards,” said commission chair Bob Gualtieri, the Pinellas County sheriff. After examining the evidence of what happened at Stoneman Douglas — including mistakes made by police and school administrators — Gualtieri said he was convinced: Shootings happen fast. There’s not always enough time for police to get there and stop them. A teacher might have a better chance. 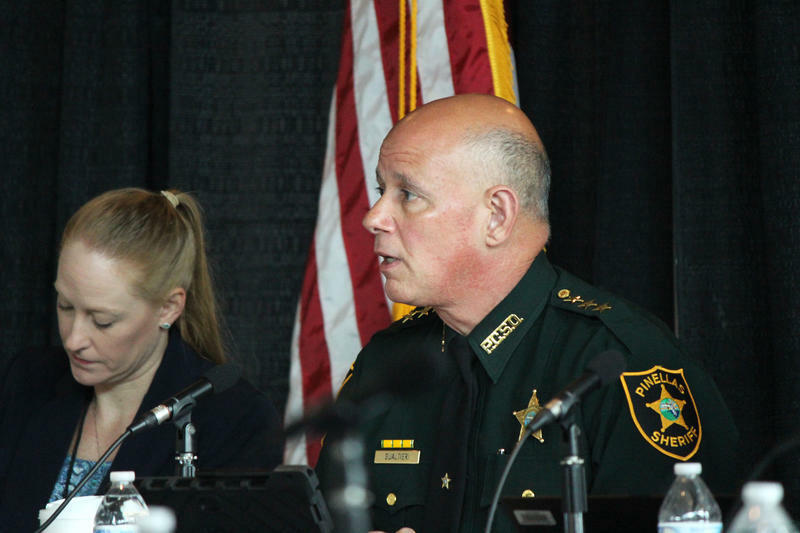 Pinellas County sheriff Bob Gualtieri is the chair of the Marjory Stoneman Douglas High School Public Safety Commission. After an eight-month investigation into the shooting, he recommended that lawmakers allow some teachers to carry guns. “They would be in a position to protect themselves and their students,” he said. This changed everything for Annabel Claprood. “I went in and told her, … ‘I'm done,’” Annabel said. Annabel had been working so hard to stay at Stoneman Douglas, to cope with the trauma she experienced just by being there. She was going to therapy, by herself and with her family. She lobbied in Tallahassee and spent her summer interning with a congresswoman, to fight for safer schools. She took care of horses to ease her stress. But she felt like the adults weren’t trying to help. They were making it worse. “They don't make any sense,” Annabel said. “Let’s prevent school shootings by putting 10 times more weapons, guns, into schools? Like, where does that make sense? “I just don't like that I can't rely on the adults to do their jobs,” she said. A few weeks ago, just shy of the first anniversary of the shooting, Annabel withdrew from Marjory Stoneman Douglas. Elyse had been thinking about making this change for a while, researching options in case Annabel came around to the idea. She was worried her daughter was getting too behind academically. Annabel said she’s happier at her new school. She’s more comfortable with the security measures there. She likes how she can do her work at her own pace. But most importantly, it’s just easier to be there. But Annie has several classmates at her new school who are in the same situation; they also left Stoneman Douglas. There’s one girl she has bonded with especially. The school is near a hospital, and so there are often vehicles with sirens driving by. Annabel’s new friend saw her react to the sirens, looking out the window toward the sound. Leaving Stoneman Douglas has eased some of her stress. But she still questions her safety constantly. “I feel it everywhere. … That's where my mind goes the minute I walk into a new place. Because I've learned the world is not a nice place, and I have to learn how to deal with it. So I'm cautious wherever I go,” she said. Annabel feels like she lost her childhood last Feb. 14. “Annabel from a year ago is still in the 1200 building, and she’s not going to come out,” she said. “After that, I just wasn’t Annabel anymore, and I needed to find myself again. So I took that summer and I took the time to really build myself again and really be a new person. 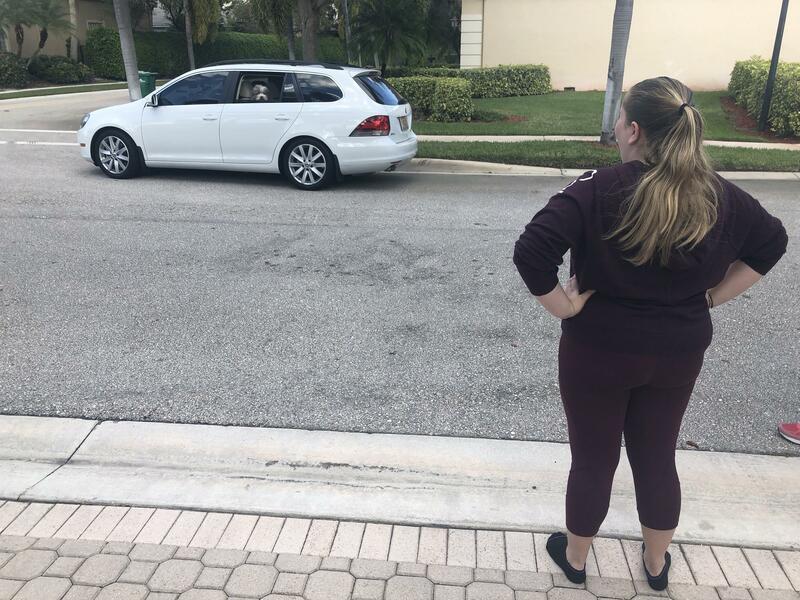 Annabel Claprood stands at the end of her driveway in Coral Springs, as Marjory Stoneman Douglas High School librarian Diana Haneski and her husband drive away. They came to Annabel's house for an interview with WLRN, so their therapy dog, River, could be there to help Annabel. River is sticking her head out the window to look at Annabel.